Q-1: How can I be able to see the "screen shots" & "Media Clip Trailer"? Q-2: My Internet Explorer does not allow POP-up windows, what should I do? If you can not see our screen shot and trailer, then you have to become a registered member and must be over the age of 21 to view adult materials. In order to view our new embedded sample movies, you'll need to update your browser with the Adobe Flash Player. Google Chrome browser already includes Adobe Flash Player built-in. It's totally free and works on other than Ienternet Explorer such as Firefox, Safari and more. Our downloadable "Media Clip" trailers are in WMV format. We recommend that you use "Windows Media Player" Version 9 or above. Click on icon below to download the latest "Windows Media Player". When you install Windows XP "SP2", Pop-up Blocker is turned on in Internet Explorer and set to the medium setting, which means it will block most automatic pop-ups. The default settings for the pop-up blocker allow you to see pop-ups that are opened when you click a link or button on a Web site. 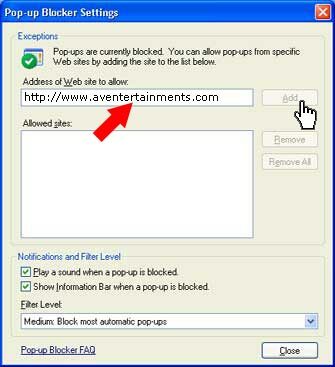 Pop-up Blocker will also play a sound and show the Information Bar when a pop-up is blocked. You can adjust these settings so that Pop-up Blocker works the way you want it to. To change Pop-up Blocker settings. 2) On the Tools menu, point to Pop-up Blocker, and then click Pop-up Blocker Settings. Pop-up Blocker Settings window Tip To temporarily allow a site to display pop-ups, click the Information Bar when it notifies you that a pop-up has been blocked. Then click Temporarily Allow Pop-ups. - On the Tools menu, point to Pop-up Blocker, and then click Pop-up Blocker Settings. - Select the High setting in the box near the bottom of the dialog box. Note:If you want to see pop-ups that are blocked when you have this setting turned on, hold down the CTRL key while the window opens.